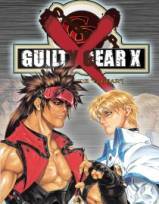 Some of you may have played the original Guilty Gear on Playstation. It was treated to mixed reviews, bordered action with those infamous instant death moves. Well now Sammy has redone the game for Dreamcast in a semi sequel affair. Guilty Gear X [GGX] reintroduces you to the original cast and a few new ones. This time around a new gear has been discovered and there is a huge cash payout to whoever can beat this new gear. So the story is pretty average, but it sets the scene for a bunch of miss fits and gears to come together for battle. However all of this is irrelevant. When you first play GGX you will be amazed by the graphics, as they have been redrawn in the DC's high-resolution mode. The characters are drawn and coloured in the 'anime' style so we get 16 colours per character and some amazingly creative backgrounds. Every attack that you land on your opponent is treated to some lovely transparent impact flashes. But we’re all men here apart from the women [allegedly] and we demand more from life than some pretty graphics. The control system is perfectly suited to the DC's pad, but you only have four attack buttons. Two of those buttons are reserved for the slash attacks [weapon attack high/low]. The remaining buttons are punch and kick. Instantly you will recognise that the scope of combo's when compared to Street Fighter is incredibly limited. That is if you treat this game like a Capcom fighting game. You see GGX shares more similarity with the SNK brand and most notably the misspelled game Samurai Shodown. In short you have to learn a new fighting system from scratch, some of the super moves are performed in the standard double hadoken movement, but successful players will have to train hard. GGX features a number of character miss-fits, the strangest of those is Faust. Faust stands the height of the screen and fights with a paper bag over his head. This may sound crap, but it works. For the hot-blooded male there is the female Russian girl Millia Rage, who fights with her long blonde hair. Yes as GGX has been heavily influenced by many anime films there is a relatively large amounts of girly characters, each willing to flash their knickers or summon up a dolphin to hit you. The sub-boss is one of those girly men characters, by which I refer to him being drawn to resemble a woman when he is really a man, shades of Cyber City OEDO part 3. The final boss is the gear Dizzy, who is possessed by two powers and has accelerated growth hormones and wings. The two bosses 'Testament' and 'Dizzy'; are playable if you perform well in survival mode. Aha! Survival mode, for the first time this has been done in a unique fashion. First your health does not get replenished, and you go up in levels based on the number of successful attacks and the length of time you survive. So in short in rates your performance constantly and does not require you to finish off numerous opponents in numerous rounds. In short the survival mode rocks. Rock, the grandfather of all music pays its respect in GGX. The music is excellent, ranging from good quality soft metal to some surprisingly good American rock music. There are a few negative points on GGX. First is the speed of the game, it is nowhere near as fast as the other 2D and even the 3D fighters. Some feature to change the speed would have been great. However the biggest problem I have with this game is the difficulty level. Some characters earlier on prove far more of a challenge than the latter characters. Amazingly these are the only flaws with the game. Well no. The best 2D fighter is definitely Street Fighter 3: third strike, however Capcom have been doing SF games for years, and maybe in time Sammy will manage to topple the premiere Capcom series. What is clear is that all future 2D fighting games will be judged against GGX's high-resolution 2D graphic quality. This game is amazing but looks like it will not make it to western shores. So I would advise you to purchase this game on Jap import. Everything is in English with the exception of the character endings, which incidentally feature only one picture of your character so you are not missing that much. This game's quality lies in its gameplay. Buy this game. 10 No surprise here, even a fool can notice that the graphics look mighty fine. However I suppose the anime look may put some people off…fools. Sound 9 A soundtrack which rivals Jet Set Radio's in terms of quality. Good quality background music. Sound effects do the job, but the music is the real star here. Gameplay 8 The main game is good, but with limited moves a new challenge is needed…in other words - Survival mode! This game will keep the 2D faithful happy for a while. But it still has a long way to go to challenge the Capcom and SNK boys. "Guilty Gear X is the premiere game to show off the DC's 2D graphics ability."